Due to many different reasons, an individual or a couple can find themselves in a type of situation where they have to face some kind of serious problem, mourn a loss, confront a past or recent trauma, and they feel like they cannot deal with it. Maybe the passing of time and the support of family, friends and other medical professionals does not help ease their suffering. Deciding to see a psychotherapist does not mean that you are weak or ill: an expert can help you find new ways to look at and deal with your problem when you felt trapped in it. 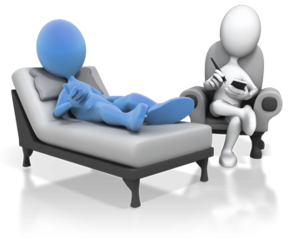 Psychoterapy is built on the relationship between the therapist and his/her patients (whether they are an individual or a couple). A therapist accepts without criticism what his/her patient says. The therapist does not share the client’s opinions, but creates a protected setting in which the patient can express him/herself freely and start experimenting new ways to build and live his/her relationships. I do not delude myself (or my patients) to be able to erase losses or traumas, but I think I can help people (re)discover new ways to cope and live, while respecting individual differences. There are many different theoretical approaches to psychotherapy: in my practice I follow a constructivist approach. Not every therapeutical approach is a good fit for everyone. And not every therapist is good match for every patient. Whichever is your choice, it is important to keep in mind that under the Italian Law, a professional can call him/herself a psychotherapist only if he/she is a licensed medical doctor or psychologist, who has successfully completed a 4 year graduate degree in psychotherapy. I am also available for didactical therapies with trainees in psychotherapy and supervision sessions of clinical cases. To receive more information or to make an appointment, please click on my “Contact” page. Maybe psychotherapy is not for you. But you still feel like you need the help of a professional because some areas of your life concern you: you need to make an important decision, you would like to manage your anxiety better or you would like to improve yourself at work. Have you ever thought about counseling? Deciding to start seeing a psychologist is not an easy decision to make. Oftentimes it is particularly difficult to decide which of the many therapists might be the right one for you. In these cases, I am available for a free informative first meeting, that usually lasts about 30 minutes. This way I hope to help you making your decision a little bit easier.